The Armin E. Elsaesser Fellowship is awarded by Sea Education Association in Woods Hole, MA to a faculty member or alumnae who wants to study the ocean with a unique approach to science. In June of 2007, I received a fellowship to study color underwater, using oil sticks on 300lb. watercolor paper while diving and snorkeling in the pristine coral reefs of the Caroline Islands, in Micronesia. The Palau International Coral Reef Center would be my base of operations for a month while I explored the rock islands and reefs, learning to construct images about the color of the world just below the surface of the tropical Philippine Sea. Photographic technology has misrepresented color underwater and creates a record of the ocean bluer than it is. The following journal was written and illustrated while abroad. Despite the years of dreaming, months of preparation and weeks of packing, travel to Palau feels like a plunge into the sea. Two days of plane travel passed as a free fall before entry. I had always hoped that I would make my way to this island chain in the Pacific known as the Caroline Islands by sailboat. Traveling by commercial airline makes the journey feel like any other; just longer. I was thankful for an uneventful series of four flights, where my only tasks were to keep my luggage all going in the same direction and to get sleep. Landing on Yap (the blackest airport after dark that I’ve ever experienced) brought into focus the remoteness of my Pacific destination and the setting of this Elsaesser Fellowship adventure. Imagine my surprise this morning when I saw a large dorsal fin rising out of the water at the edge of the Palau International Coral Reef Center compound, ninety feet from my apartment. I was seeing the landscape of my new home for the next month from the balcony. I had arrived late last night and had gone straight to bed. It didn’t last long, but the momentary alarm became funny when I realized that the fin belonged to a large reef shark that circles the tank with a vanishing edge parallel to the natural inlet. Clever, the Japanese landscape architect that designed the aquarium. I get to wander through this beautiful facility after hours, and can’t help feel that I’ve been mistakenly locked in. I was introduced to many of the people that work here today and I have started to arrange for diving and the charter of a kayak. Steven Victor, the Centers Director has told me that I can snorkel just off the dock to a sandy spot that I can see from the conference center. This is where I will practice drawing underwater with a mask and snorkel as I did off of Coffins Beach in Gloucester this August. The difference? This site will be a lot warmer and more colorful in the shallows. I’m very glad that the Reef Shark keeps to his exhibit. Most of this second day was spent organizing and learning more about Palau. It was a short walk to town to get food, but the rain and street flooding made it a difficult trudge back with a heavy box of provisions that should last me for a few days. Not many people walk here; only children and tourists. With gas over $4.00/gallon and lots of traffic on the rutted roads, I think that the locals should reconsider. The Palau National Museum was not far from the main shopping area of town, so I took the detour and enjoyed the chance to get out of the rain and read more about the history of the islands. It was sad to realize that the Peabody Essex collection of Palauan artifacts was better than what was displayed here. The newest exhibit(from 2005) was a collection of contemporary artwork from each of the islands in Micronesia. I found the one or two pieces that each nation chose to represent their best creative efforts very revealing. Not one was about color; almost all were pieces made from natural, found materials. In the time line of Palauan history there was information about a few foreign artists that had come to work here in the islands. Most of the painting that I have seen by local artists is stylized imagery and designs applied to carvings. Maybe traveling alone heightens your imagination; sharks circling your apartment, large Blue Wrasse dancing before the camera?! My form at the edge of the largest tank really got the attention of the Reef Shark and Wrasse, and although I would like to think it was my friendly personality that got the reaction, I think my shadow must look a lot like the person who feeds these huge creatures. Carol, who is Head of the Education Department at PICRC took my offer to help and suggested that I put together some simple coloring pages for a large group of Kindergarten children who will come in a couple of weeks. This morning I sat down in front of the tank which contained the Archer Fish and realized how stubborn some fish can be. As soon as I got comfortable drawing, there were no Archer Fish to be found(maybe their illusive behavior was the reason for the request). It took a couple of hours to get the basics for their form on the fly as one brave Archer or another would check out the viewing glass. At high tide I suited up to snorkel around the wharf at the compound and to try drawing at a sandy place fifty feet from the concrete bunker. Because of the boat traffic, I dragged along with me a float which also held my materials. I was surprised by the cloudy conditions and the lack of color. There was the remains of a wreck, old tires and a lot of silt. When my plans to draw were dashed by the monochromatic site I swam to the opposite side of the compound where I was told that I would find some giant clams. Despite the cloudy water, the clams were velvety and beautiful as they sat opened up towards the light. Garry, the research trip organizer here at PICRC, surprised me this morning with a kayak that I can charter from one of his friends. I am so happy to get some water transportation that will take me out and around the rock islands. With this pink ocean kayak kept here at the dock, I can start to plan my week. There is a lot I can paint very close to the center, I’ve needed a way to get there; and here it is. I felt very lucky today to be invited by Carol to go to a Palauan “First Time Mother” ceremony. The new mother’s family puts on this large gathering at their home ten days after the birth of the new grandchild. The young woman is bathed in oils and turmeric after the delivery and attended to until she is reintroduced to her family and friends. This is her coming out party. It lasted all afternoon, with dancing, offering of money, a delicious meal and the passing around of the new child for everyone to see. Palauans are welcoming, gentle people who know how to party and make family the centerpiece of their life. Today my cruise plan was a simple one. I was going to deliver my referral form for my dive certification to Sam’s dive shop (somewhere behind the island making the opposite shore of the channel in front of the PICRC). I got directions and would have the tide with me on the way back. The weather was calm. Passing showers were predicted for the afternoon; what we have been experiencing each day since I arrived. I prepared to get wet, but I also planned on snorkeling and possibly drawing when I found a good spot. I packed lunch, water and lathered up with sunscreen. It was the perfect weather for the first outing; overcast and calm. Finding my way through the rock islands was tricky because there are no signs for anything. Even the dive shop, the largest on the island, was badly marked. I found it by asking directions as I took each new turn. With the first leg of my paddle complete, I took my time through the lagoon formed by the rock islands, photographed and ate my lunch. As I headed to open water hugging the shoreline, the clouds darkened and it began to rain. When the rain became sheets,fog rolled over the islands and the water swelled to two feet. I decided to turn back towards town, riding the surf and wind. And as quickly as it had built up, it subsided. I wasn’t going to be undone by a manageable squall. I turned around again and paddled hard against the swells and tide to get to the the place where I had seen a speeding boat enter. I hoped that this was the cut for the channel that I was looking for. Rounding the tip of the island I was rewarded with a placid northward moving flow of water directly heading to the Coral Reef Center. My arms were tired, but I was happy to have ventured beyond the compound that I have been tied to for these first days in Palau. With this successful paddle, I could start to acquire the experience of the rock islands I have come to paint. Epilogue: While the Pink Kayak sat tied to the dock this afternoon, it sank. Garry said that it had a small crack that the owner had repaired with epoxy. It did take several hours to fill before it went down, but it put my whole mornings voyage into a new perspective; Pink, Pink, You Sink!?! Now I will have to find another means of exploring. It is hard to imagine a more amazing experience than snorkeling and drifting with the current along the edge of a coral reef here in Palau. I tagged along with the research team today as they did a survey of coral and a Grouper count. Our first stop was to the south, through the rock islands and as far as the surf washed crescent shape barrier reef; about an hours boat ride away. While the others dropped over the side with their tanks and disappeared, I was ferried to a shallow edge of the reef to snorkel, skirting the swells and enjoying the activity of colorful small fish in their garden of coral. Our next stop was to “Clam City”, nursery of the Giant Clam. Garry and the others ate their lunch as I took my oil pastels and paper to a shallow area where I could snorkel and draw these sculptural creatures nestled in the sand dusted coral. When the clams are open, they reveal their velvety bodies and the variety of beautiful colors. Being here in the tropics has changed my mind about color design. I think from now on when people ask, my business is Solar Power. You cannot help but feel completely moved by color and light every minute of the day here in Palau, especially out on the water. The intense sunlight penetrates deep into the ocean and reflects off the surface; turning even the underside of clouds a grayed version of the gem like tropical turquoise. There is more color here than I have seen anywhere; and so much sun that I have to keep sun protection at hand. I spent another day with the local research guys, going by boat north to the second Grouper spawning site and a restricted coral reef that they are monitoring on the West Passage. Nowhere else in the world would you get me to drop over the side, 5 miles from shore, to drift /snorkel on my own . The water is so clear and warm, and the reef is just teeming with life. Sebastian, Jay and Arius dove in the channel that had taken us about two hours to reach and I followed the reef edge above them. I could sometimes catch sight of their tape measure as they moved along recording data. Otherwise I was watched over by our capable boat driver Masao, who picks me up when I signal. Because of the wind, the water is less clear than yesterday. We see a turtle lawling on the surface. I watched large schools of black fish travel the channel out to deeper water. For lunch we anchored on a shallow area. Arius dove for clams and rewarded the crew with lunch. They eat the mussel of the giant clam raw with soy sauce and taro. It’s funny how familiar you can get with fish. I’m starting to know some of the quirky behavior of the other “guests” here at the aquarium and I can see that they are starting to recognize mine. I have been spending the mornings before everyone arrives drawing the fish. Some, like the Napoleon Wrasse, appreciate the attention. Others disappear when they see me coming. The Nurse Shark likes to lay with his snout into the water jet that brings fresh seawater into the large tank. His overbearing personality was illustrated this afternoon after feeding time when he decided to harass everyone in the tank, but took most of his frustrations out on the turtle. The seven foot shark head butted the turtle in the shell, moving him around the tank by repeating this maneuver each time the helpless reptile slid out of his way. I have been told that a couple of the fish in the past that have shared the tank with the Shark have disappeared or have been found outside it. I hope that the turtle can put his shell to good use and stand up to the bully. Carol took me with her to town this afternoon and I was able to shop again at the open air market where I had bought the best bananas last week. The local Palauan food is delicious. I got a couple of prepared meals in plastic boxes which lets me sample a variety and makes it so that I don’t have to cook. I really like the noodle salad that is vegetables mixed with noodles in a somewhat spicy sauce. One woman at the market offered me a sample of sea cucumber. She had zip locked bags filled with the finely chopped meat. It was slimy and crunchy at the same time. It looked just like the food that they use for feedings at the aquarium and has a taste of fish in brine. My first activity this morning was to help the Education Department lead sixty five, 3-5 year olds, dressed in blue uniforms through the aquarium. I had prepared two coloring pages for their arrival. This gave me the chance to draw the fish and to get to know the exhibits. The children were so well behaved. They came in like a fast moving cloud pattern and were gone after only an hour. Their energy and curiosity really livened up the place and I was glad for the chance to hear their comments and to see their beautiful faces. The wind and rain that persisted today made it practical for me to work on a painting from an image on the laptop that I took out at the rock islands. This is the first time that I have done a painting from a photograph. Although my objective is to paint from life here in Palau, sometimes the conditions make it impossible to work at a site that is intriguing. I have been inspired to try capturing the dramatic sky that change in an instant . The color, form and movement of the weather systems require that I work really quickly. I hope that I am up to the challenge and can retain the luminous quality that comes with the changing light over water. I spent a lot of time imagining the work that I would produce preparing for this trip. During the summer, when I realized that I could draw successfully while underwater, I focused much of my thoughts about color below the surface. Palau is known for it’s unparalleled diving. It seemed the natural direction for my work to take while in the islands. The strong tropical sunlight penetrates deep into the water here, illuminating the flora and fauna of the reefs and shallows. My plan was to experience the color of the rock islands from above and below the water, documenting my direct observations with paint and oil pastel on paper. While I have followed my original course of study; painting along the shore, using oil pastels underwater, some aspects of the plan have been changed by reality. Today I worked from the Center’s dock, protected from the sun by a palm tree. I’ve already abandoned the idea of painting from the kayak. It wasn’t the sinking that convinced me. The paint dries too fast in the full sun and there is no room to put things. There is also the ever present current, which means that I move constantly, mostly away from the subject. The dive belt weight tied to a line that I have for an anchor still allows me to make too large a sweep with the wind. And there is plenty of wind. Even on land my easel gets tossed every time a squall moves through. This is what adventure painting is about. I decided to give the pink kayak another try after Garry went to the trouble of fixing the cracks that were visible on the bottom. He used a soldering gun and hard plastic to coat the area, and I have to say it felt tight. Tu, who is Palauan and works in security here at PICRC, said that she would take me to the rock islands to the west. We had planned our trip to start early while the water was calm and the tide would take us out in the morning and in with its return in the afternoon. We paddled down the channel, hugging the island chain that I look out to each day, and were pleased with the day of fun that we imagined was before us. We skirted the “Giant Clam” mariculture site and headed for the cut through the islands that another boat had just come out of. As we began to make the pass through two small rock islands on the outer edge of the main channel, both Tu and I felt the kayak become more unstable with each stroke. There was an exposed rock outcropping at the nearest edge of the island so we nosed the kayak up to it and I got off to get the camera to shore and to see how the boat sat in the water with only Tu onboard. It was clear that the kayak was taking on water. And Now with two passengers, we could not continue without risk of capsizing. If you have to be stranded on an island in the Pacific, it’s best if it is next to a well traveled channel. Having the “World’s Loudest Whistle”(which I had just yesterday spent $10.00 for) is also a must. We tried to empty the kayak by pulling it up onto the rocks while we also made an effort to flag two of the three boats that passed our way. The speeding boats must have thought that we were having a picnic. Each boat captain and passengers waved happily as they raced through the cut, on to the very same rock island destinations that we had planned for ourselves. prepared to get out into the channel and really test the range of the whistle when someone came by again. Lucky for us it didn’t take long for a family on their way fishing to see that we needed help.. Tu waved the paddle and I blew the whistle and motioned for them to come to our rock. So we were spared the 1.5 mile swim/walk across sand flats to the center . The family was a friend of Tu’s, so we had a good laugh about our kayak expedition cut short by another leak, “Survivor” style. There is a limestone wall that gets the early morning light across the channel looking west from PICRC. The dramatic profile of warm stone with the first sun contrasts with the black clouds that move through Koror almost every morning. I had just enough time to do one session on a painting that I have wanted to start since coming to Palau. At 8:00 I got a ride to the public elementary school to be one of the judges for the science fair. This is “Youth Week” and there are all sorts of educational activities planned for the children of Palau. What a fun way to take a painting break and meet children from the community. Their projects were terrific! I learned all sorts of things from their displays; medicinal uses of local plants, their concerns about “Global Warming” and constellations in the winter sky over Palau. Later as I walked to town on my way to the bank, two sixth grade girls waved vigorously to get my attention as we passed on opposite sides of the road. Palauan children, like their parents couldn’t be more welcoming. It has taken me two weeks, but I have finally figured out why there isn’t a landscape painting tradition here in Palau. It’s certainly not because there is a lack of worthy subject matter. I think it has to do with speed. At the very instant that I begin to lay out the image, everything changes. It can rain with a downpour or become blazing hot. I’ve learned to locate under a palm tree where ever possible, to minimize the damage. As stunning as the cloud formations can be, they also move with the swiftness of fast forward, changing the palette of color as they roll through. Most times that I plan to go back to a site to do another session on a painting, even at the same time of day and tide level, the light conditions are drastically different. To add to the hurried pace to get color down, is the shortened drying time of the paints. The sun that reveals the tropical rainbow of color, takes the moisture out of acrylic paints so fast that it is hard to keep a wet edge. The Palauan’s easy going nature makes life here calm. I’m sure that they decided long ago that painting the wonders that they see everyday were not worth the frantic effort. When asked why there aren’t many Palauan’s that fish, they say that the men will fish to impress a woman, after that they only fish to eat. I imagine painting the storyboards to sell to tourists is enough of an endeavor towards capturing the awesome nature of their islands. It must have been a color savvy Palauan, a diver, who created the flag for the Republic; a yellow sun on a tropical blue field. A simple statement honoring the three elements that set this beautiful country apart; the sea, the sky and the sun. Though the men get most of the credit for craftsmanship with the storyboards that they carve, it is the Palauan women who have a hand in making so much of what is beautiful here. I was overwhelmed by the grace and functionality of the new Civic Center, that Carol told me was designed to look like a butterfly by a local women’s organization. Every detail was simple but symbolic of the culture that it showcases. Wandering the garden and grounds I thought about how wonderful it would be to see an outdoor concert or performance here tucked next to a piece of natural jungle, right in the middle of Koror. On my way back to my apartment, I visited the Senior Center to see the women making woven items that they sell to the public. Every Palauan woman carries a bag made of palm or other fiber woven with intricate details; a lining, small pouch, or painted geometric pattern. Two of the woman were using plastic raffia to produce the “grass” skirt worn by the girls that did the performance at the ” Custom ” that I attended my first week here. Those that chew betel can buy accessories to hold the lime that they put on the nut before chewing, to keep their supplies of betel nut handy, or to spit into discreetly. All are made with the fine texture and detail that takes hours of hand work and care. And then there is me; still trying to create landscapes that retain the color and movement of these gorgeous tropical islands. I am afraid to leave without having made enough attempts. Returning to New England grayness will erase the color sensitivity that I have gained with each day, swimming, paddling, and walking. Just as I find it impossible at home to paint an image of another season other than the one that I am in at the time, my heightened awareness of color I fear will change to another scale when I return to Essex. I can’t help but feel like a fish that feeds or rest with the changing light conditions. This is the challenge that the aquarium staff faces each day; to try to replicate the conditions in nature that allow the super sensitive fish to live as they do in the wild. Not an easy task! I had seen a picture of the Palauan Capital Building, but nothing compares to the sight of it. As you travel north from Koror over the large island,”Babelthuap”, it rises up out of the green sea of vegetation, alone on the top of the crest. It was modeled after the same in Washington,DC, but with a Palauan twist. The pilasters and freezes are adorned with simple Palauan designs for money, justice and man, which on a classical western form of architecture look out of place even to the Palauans who took me there to see it for myself. Carol, Ines and I marveled at it’s size and awesome setting overlooking a reef of the West Passage. This colossal project took over 40 million dollars to build. Our tour inside revealed many of the design flaws that make it as incapable of functioning for the government of Palau as it looks. In it’s awkward presence we were able to reflect on the shortsightedness of governments with power and money. Being an American abroad can require a lot of explaining. It was nice to share the anguish of a bad decision made on the Palauan’s behalf and know it was not our fault. Carol has taken it upon herself to show me everything that there is to eat in Palau. I go along willingly because my experience from the first has been wonderful. There are locally prepared foods at almost every market and at roadside stands. Carol is so generous of spirit and in reality that she had an entire bus load of Tiawanese literally eating out of her hand. She had purchased a small tray of watercress, which she silently offered to one woman from the group that had stopped like we had in search of local fare. After one sampled, then all the others lined up in quiet order and tried Carols dish. When I first arrived Carol explained that in Palau no one goes hungry. They all share so that everyone is cared for. I have experienced that kindness and it tastes terrific! You could tell last night that it was the eve before a holiday. Here at the dock, people were readying their boats to go out fishing. Several men from the Center left at about 5:00pm and returned at about 7:00 this morning with quite a variety of fish. I asked Masao who was sorting and washing the catch what the name of the yellow fish in the pile was. I recognized the Parrot, the Red Snapper and the Grouper. “Yellow Fish”, was his reply which got a laugh from everyone on the dock. I guess I was expecting some beautiful Palauan name like those that they use for islands and reefs. “Really”, he said almost apologetically. All of the Palauans that I have met have some facility with English and can go back and forth between the two languages. I guess the universal language of color makes fish identification simple. Tropical fish are too pretty to eat. Despite their large size, they still look to me to belong in an aquarium. Youth Day may be a great chance to get out to fish for some, but for most Palauans it is a day to focus on the education of the young. I have been told that this holiday has been so successful in encouraging programs for the school children that they have had to extend the the opportunity to plan things for the students over a whole week. It seems so like the Palauans, who value family above everything else, that they would devote a day to honor the youngest of their community. Today was the beginning of my underwater adventure in Palau. I have to admit that I worried a lot about this part of the trip. Thoughts of maintaining neutral bouyancy, equalizing and remembering all the various steps to make diving safe, kept me awake some nights. But last night I approach this final test of my will to dive somewhat casually. I think the Palauan approach to life has started to soften my New England outer shell. After readying my gear and reading over my text’s highlighted area, I went to bed like I have for the past two weeks and slept well. My dive partner couldn’t have been better. Haak is a German, who lives in Hong Kong. He’s here in Palau for a vacation and to work out his next job move. Like me, he loves the beauty of the natural surroundings, the Palauans and their rich culture. He is as happy to be here as I am, so we started our class at Pincher’s Cove with nothing but excitement and joy. For Haak, his day would be made by seeing a turtle. Looking around at the turquoise lagoon where we would dive, I was happy to fall back into the water and make our first dive. Our Instructor Joedyn has certified over 1000 divers and his calm easy manner was proof enough for me to follow willingly. Making our way from the sandy shallows out to the deeper waters of the coral bed was not effortless for the first several minutes. After I was able to relax, I lost track of the load breathing sound so different from snorkeling. My equalization was working, just not as fast as I would have liked. Removing my mask and clearing it was not something that I found hard. I learned that I could get along with some of the discomforts and just enjoy the sensation of being weightless and the wonderful view. Not long into our decent we all saw a Hawksbill Turtle swimming out from under a coral shelf. I wanted to signal my glee to Haak, but thumbs up means ascending. I could see his awe through his mask and in his outstretched arms. We’d both met our objectives with the very first dive. Our first descent of the morning was at Dexter’s Wall. We joined a group of experienced divers for the day in the Rock Islands;no more quite lagoons. Now to make two dives guided through a typical site here in Palau before certification. Less skill work and more fun diving, Joedyn assures us. I was up for anything given the success of Saturday. Haak had seen his turtle and was now hooked. He was already making plans for the rest of the week at other sites. I was still cautious about committing to anything in the future. I was trying to live in the moment and not think too hard about anything beyond today. My new motto since coming to Palau; Think Less/Do More! We started off making our dive over the barrier reef.There was some current, but it was manageable using the mooring line to ease our way down.The plan was to level off at at 60′ (a depth that I would never had considered had I stuck with my old motto).You could immediately see the difference in swimming along the wall. This was more like the Ulong Channel that I had snorkeled with the Coral Reef team. We saw all sorts of fish in small, medium and large sizes. Sweet Lips was the name of one gorgeous fish ;purple spots over bright yellow, and a luscious open mouth. Corals were purple and yellow ocher in some areas with teal green and cobalt blue sparingly arranged. The fish and the corals seem to know what looks best. You see a huge, bright yellow table coral festooned with royal blue fish. The combination of compliments, electric. We were waking some of the fish and the turtles as we passed. The reef shark was not bothered and slept on in a sandy bed. Our second dive brought us to the Blue Corner, the most famous of the dive sites. It is known for large pelagics and I was not sure I was all that interested in seeing sharks. Everyone else was; so another opportunity to use my motto. The Blue Corner was definitely blue; and out of the blue came the White Tipped Reef Sharks. I tried to swim like I knew what I was doing; not the injured seal that I felt like, equalizing and snorting the water out of my mask as I flippered my way along the channel edge. I was glad to stick close to Joedyn for guidance while under the sharks watchful eyes. My new motto works great for getting out and trying new things, but I think swimming with sharks requires some thinking. Now that I am a certified diver my options for making plans for the rest of the month have opened up. Haak and I will do another dive with Sam’s Tours to the German Channel(that seemed appropriate to us) where we hope to see Manta Rays. I’m just thrilled to have completed the course and to know that I will get more capable which each experience. I hope the T-shirt shops have a great looking shirt that reads, “My Mom Dove the Blue Corner, Palau”. I will get three and hope that my sons will be inspired to use my new motto. Breakfast with the fish this morning had a new element of familiarity. My ears were still filled with water from yesterday’s dives, so just watching the fish race back and forth in the large tank like they do on the reefs, made me feel as if I was still submerged; only quieter. The sound of breathing with a regulator is really loud. Visually the experience of diving is spectacular. It’s the noisy breathing, pressure on your ears and the strange quality of underwater sound that takes some getting use to. Feeling the warm morning light increase all around me as I follow the activity of the fish in the aquarium, is a nice change to seeing the same 40 feet under water. And my feet are finally able to dry out sitting here outside the tank. While at Pincher’s Cove, I saw a large Sea Cucumber just like the one that attaches himself to the glass in the aquarium, displaying his bright orange underside. Today I learned how he is able to turn around. As I approached the tank with cereal bowl in hand, the two foot long invertebrate was standing up and looking around. Most mornings I find this oozy creature tucked up in the corner of the coral. Today he looked as if he had a backbone and could walk. Kambes, who creates the beautiful aquarium habitats, told me that this is the position that the Sea Cucumber takes when it spawns. Morton, one of four security guards here, and an aspiring fisheries biologist, knows all about the habits of the fish that he watches over each night. I’ve even found him extra early for one of his shifts, checking on the fish in their various tanks. It’s Morton’s love of all sea creatures and acquired knowledge that has helped me become more familiar with many of the organisms that I have seen on the dives. I’ll spot something that he has pointed out in the tank and know what it eats, when it sleeps or if it is something that might bite if poked or prodded. It’s Morton that is here for the first seating for breakfast each day with the fish. Haak and I arranged to do another day of diving as buddies. After four dives together, we were comfortable with each other’s emerging styles and were both hoping to add Manta Rays to the list of species we have seen here in Palau. Just a pleasant day of working our way along the magnificent coral reefs would satisfy us. Our guide, Joedyn, planned our trip trying to avoid the strong current that limited the bottom time for the previous day’s divers. We started at the Big Drop Off, which seemed bottomless. The rich cobalt blue of a channel ran the length of the Rock Island that marks this site. Haak was greeted upon entry by another giant Napoleon Wrasse; they seem to enjoy acting as hosts to divers at each venue. Schools of large fish, huge groupers and the occasional shark made this an enjoyable first dive of the day. Lunch was on a white sand beach, which gave us time to rest and go shelling before the second dive at German Channel. Small white sand dollars and limpets were the only shells that were not inhabited by hermit crabs or broken by the wave action. Since my camera battery had not recharged over the night in its wall mount, I was frustrated with the spectacular color that changed with every minute and was lost. The current at German Channel was manageable, and the dive route gave us an opportunity to cross the sandy bottom, a cleaning station for large reef sharks. I was not disappointed when they were occupied with other interests and not hanging out here at their underwater spa. There is enough colorful coral and fish to keep me entertained without the excitement of sharks. From what I have read and from talking to other divers, strong currents bring greater fish activity, which could explain why we saw very few large predatory fish and missed the Manta Rays that I wanted to swim alongside. Haak decided to make a third dive at a wreck and joined another boat. I went to see the Jellyfish lake, a site that I have had on my list of things to see. What a relaxing way to end a day, floating like a dead man in the saltwater lake while watching millions of golden jellyfish of all sizes pulsating through the emerald water. This closed environment has allowed the jellyfish to evolve without their normal stinging cells and they live in a symbiotic relationship with an algae particular to this lake. I have a Taiwanese diver, David Shea, to thank for sharing his pictures with me and pointing out the Rock Island they call, “Homer Simpson” as we sped by on our way to see more natural wonders. Artist’s know that they have to take risks to make progress. You can ruin a perfectly wonderful painting just by trying something new. But the leap of faith can also take you to unchartered waters, where scrambling for a footing rewards you with new insights and a fresh work of art. Palau is where I have hoped to rediscover the rainbow of color that I use each day in New England. With more light than Essex at 42 degrees north latitude, March is brilliant in this chain of islands just 7 degrees north of the equator. I continue to use the same work habits that I have developed over the years to begin the paintings, but I’m also being challenged to try new technology, and ways of researching the tropical environment. This is the first time I have used photographs to capture the drawing of a sight and to stop time. The color is inaccurate, so notes taken on the water and memory are what I rely on to paint. Learning a new camera while capturing life as I find it in Palau, has been a large step forward in picture making. Unfortunately, I have also stepped backwards quite a bit, losing a few days worth of images that particularly illustrated the Rock Island color. Today I am trying to see what I have been able to recover over the past few days of experimenting. At the same time that my copying methods were deleting files, the battery for my camera was not charging over night. Twice I ended up at the Rock Islands with camera and no power. I have been told that the electricity goes in and out here at the Center. Now I am prepared to deal with this inconvenience. Too bad it was at the expense of loosing one and a half days of picture possibilities. The positive side to this technology glitch is that it has given me the excuse to get help from others. At home I have Colin to thank for the patient help with all things technological. Here, Tony our engineer at PICRC has been more than willing to answer my questions and use his volt meter to check my battery charger. Out at Jellyfish Lake yesterday the kindness of a complete stranger, David Shea, downloaded pictures from his trip to the Rock Islands so that I could use them for the blog. It seems that it is not just artists that have learned that taking risks can have happy consequences as often as not. Last night was the first time that I was out in town after dark. It has been so good to work and catch up with the blog here after everyone leaves for home, I have stayed within the gates for three weeks. With an invitation to meet Haak at the popular Indian restaurant, “The Taj”, I was glad to be locked on the other side for a few hours. My German dive buddy has become a regular at this hot nightspot with an open air terrace. We recognized many of the divers from Sam’s Tours, enjoying themselves out in the warm tropical breeze. It was a chance for me to find out about the three dives Haak had made since we took off in different boats,Tuesday afternoon. Haak has really taken the time to develop his diving experience and to see what is here in Palau. On one dive he hooked into the coral of the reef to hold fast and watch the fish life sail by. That is the technique used here in Palau to deal with the sometimes unmanageable but rewarding current. As we sampled the equivalent of a Chinese Poo Poo Platter, we dreamed up ways for Haak to use his garment industry experience and contacts to frequent the Pacific Islands(especially Palau), to work and dive. What an exciting possibility to have a new passion that could become his career. And after a day of painting and writing, I had another chance to leave the grounds of the Coral Reef Center for a second evening out. I was walking back from town with food from the market when Carol drove by and invited me to come with her to a dinner party being given in honor of Rachel and Everett Walton. Everett has been the Special Prosecutor of Palau for the past eight years and will now depart with his wife to Hawaii. Rachel is an artist and a member of the woman’s organization “Didil Belau”, Palauan Bridge, giving the going away party. They are a group which welcomes ex pats to Palau,and raise funds to support children participating in international spelling bees and other educational programs. Tua Tmetuchel, the groups president, hosted the dinner at her elegant home, which gave me my first chance to see how a Palauan house is furnished and arranged for family life and entertaining. Everyone was from a Pacific nation, the US or Europe. We all sat in the high ceilinged living room and compared the favorite restaurants and menu items that they have discovered here in Palau. I especially enjoyed talking to Tua, her daughter and grand-daughter. Each have experienced the world beyond these islands and seem happy to share their rich cultural traditions with those of us who are lucky enough to visit. I hate to admit to it, but I have been thinking about this subject everyday since coming to Palau. It’s not that anyone has asked me about my favorite color, but I think it may be that I have positive memories of the color of tropical water. The first bike that was bought just for me was a 3 speed Raleigh in deep turquoise and provided most of my childhood adventures. In college I spent four happy summers teaching sailing from a Boston Whaler with a Bermuda Green interior, a warm contrast to cold New England waters. These color memories are deep rooted and seem to be stimulated each time that I catch sight of a band of tropical sunlight on the ocean. 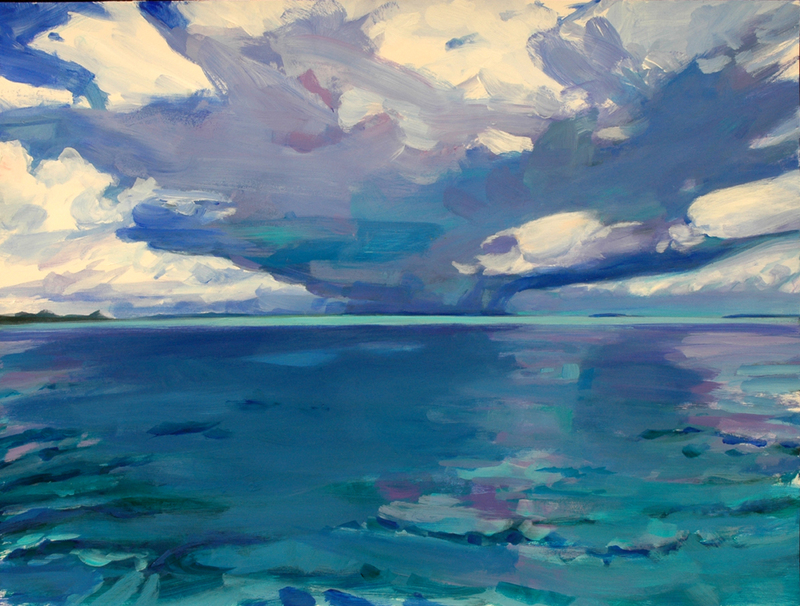 Here in Palau it is a constant hunt for an image to paint that draws me to capture the satisfying range of luscious turquoise illuminating the water’s edge, vast stretches of a sun lite strip of reef or radiate as if from below, along the intersection of water, limestone and air. I cannot simply select a green blue that matches the band of color within the picture frame. Each painting is a scale of relationships that works when all that surrounds the tropical turquoise allows it to glow with the warmth of the sun and allows me to taste the sensation that is turquoise. I needed to get out to the Rock Islands today to do some painting. I've found lots of spots to work from around PICRC and on trips with the research boat, but more time in the Rock Islands south of Koror would give me picture making possibilities found no where else in the world. Yesterday I arranged with Sam's Tours to drop me off at an island for the whole afternoon and pick me up on the return trip. I would have time to do a couple of small paintings, snorkel and shell along the beach. I can't think of a better way to spend a Saturday. Lucky for me it was a trip with the guide, Lalii, who knows so much about the Rock Island flora and fauna. We started out at the Milky Way, for a swim in the limestone clouded water. We lathered a handful of pure white sludge from the shallow depths over our skin for a spa treatment. It was a relaxing start to my day out on the water. I ferried my things from the boat to the beach when we arrived at Ngermeaus, and could see that it was a perfect location. Haak was taking this Rock Island tour as his last day in Palau. I impressed on him that he needed to remind the driver to pick me up before heading back to Sam's. An afternoon on a rock island was a heavenly idea, twenty four hours alone was a whole different adventure. I had brought lots of water for myself and to paint. Sam's provided a wonderful tray of sushi. After the tour shoved off, I sat under a palm tree, ate an early lunch and was thankful for everything. I took Lalii's suggestion and snorkeled from the sea grass bed on one side of the island to a channel to the left. As I turned the corner of the beach, the Black Tipped Reef Sharks were just where she said; at the edge of the bathing area where a boatload of Taiwanese were splashing and swimming. I guess we all are becoming a bit casual about sharks here in Palau. I have an idea of how the sharks feel about us. After setting up my paints under a palm tree and starting the first painting, several people came up to watch. One boy from the Marshall Islands, named Truly, enjoyed telling me about his travels in the US and I was kept entertained by his wide open sense of the world. I enjoyed the interaction with people while I worked, but soon all boats left and I was happy to try to complete what I had started. There were moments when I could sense the cooling light and wondered if I would have to find a comfortable place to sleep. Not to worry; at 4:00 the boat arrived and everyone jumped in to take a look at the sharks that had been host to the midday crowd. Palau is primarily a Christian country and today is Easter Sunday. With my family back in New England and the nearest church that I’ve seen too far to walk in the heat, I’ve decided to observe the holiday here at the Aquarium. I think this is the first time that I’ve missed Easter mass, but I was up with the sun rising over the Rock Islands and thought of all of the sleepy sunrise services with grumpy teenage boys that I’ve attended. The quiet contrast gave me time to reflect and appreciate the new morning. After breakfast I wandered the grounds and took a peek into the lab where the aquarium workers operate from. Joetlin, the brave crocodile and shark tank cleaner, was brewing the food for the jellyfish. The recipe calls for hatching shrimp eggs over a twenty four hour period and straining it. The resemblance to orange soda, uncanny. If you were wondering, jellyfish eat in the evening so this time consuming process has to be attended throughout the day. Later, Joetlin explained about how the water temperature of the largest tank is kept to a range that would exist at 100′, and I thought about all of the natural conditions that have to be copied to keep the organisms happy in their artificial home. At 4:00 I met Kyoko and her Japanese friends at Sam’s Tours, for some kayaking. A serene ending to a contemplative day. Kyoko, and other Japanese that I have met on this trip, possess a patience and quiet that I really admire. Each step that they take is thoughtful. I think that their deep regard for nature is expressed in their design as well. It is Kyoko who makes a fashion statement each day with her T-shirts. The Palau International Coral Reef Center and Aquarium, so beautifully compliments the rock island landscape, functions with simple elegance and is also a Japanese creation. I think that they would agree with my long held motto; beauty before function. Rain in Palau is a welcome relief from the scorching sun. A full day of it gives me time to catch up on the blog and finish some of the work that I have been doing out in the landscape. Todays showers also brought more buses of visitors to the Aquarium that I can see from the window of the lounge where I work. The Korean “Honeymoon Tours” are the most fun to watch. You can recognize them immediately by their colorful dress, each infatuated pair in matching outfits. The mating ritual includes lots of picture taking by the males, equipped with tripods. The Females pose like Hollywood stars by palm trees and in front of flowering shrubs, a carefully selected flower placed over one ear. They move fast like a flock through the exhibits, capturing them on film is tricky. As Ronda pointed out to me (she works here at the Aquarium and knows their habits well), each photo session ends with the female presenting a flower to the smiling male. Who needs to watch fish behind glass? Kambus, the Aquarium manager becomes part of the seagrass bed exhibit as he cleans the tank like Spiderman submerged. From my second floor vantage point, sometimes the fish are the background noise to the activities really worth watching. Most of the information that I have gathered for painting the rock islands I have gained while tagging along with the research crew on their collection outings. This great group of local guys have put up with all of the materials that I bring to work on the boat or underwater, carefully stowing them with their own equipment, and retrieving them when an opportunity to paint presents itself. Working on the water, especially unfamiliar territory, takes flexibility and planning, and that has been beautifully orchestrated by Garry, the trip organizer and manager. Each time I have crashed their research party(they definitely have a good time), It has been Garry who has made sure that I get to see what there is to paint or photograph at the new location, as well as traveling to and from the site. Somehow he has a sixth sense for the pictorial and each trip has been endlessly rewarding. Todays outing to a Marine Protected Area(MPA) in the northeast, was the most productive for me yet, and sadly the last. The crew was scheduled to count invertebrates (Sea Cucumbers galore) with the dropping tide on the sea grass bed, that became more and more exposed as they worked. I started a painting on the boat while they did the first two transects, to take advantage of the earliest light and the fact that I was dry. I jumped onto the flats to snorkel and draw with the oil pastels for the last two. When Garry realized that they had missed one of the transects, he used the opportunity to ferry me to the small village that rests at the mouth of Palau’s largest watershed area, adjacent to the research site. Yim had told me that I should ask to stop there, if time allowed. From the water, Ngersuul is served only by a jetty made by coral rubble that has loosened over years of exposure. Arius gallantly carried my paints, easel and paper across the most treacherous collection of rock, with me scrambling behind. He said something to the family that was out in their yard as we arrived (I assumed as an introduction in Palauan), made sure that I was out of the sun and walked back down the long row of coral back to the boat. For two hours I worked furiously trying to capture the colors of the water, bounded by the barrier reef and sliced evenly by the village’s hand built jetty. It was the most challenging site that I have done here in Palau, but the most rewarding too. For me it compresses the color of the Rock Islands in a vista of exposed coral reef. The afternoon was a gift from the sea (borrowed from Anne Morrow Lindberg’s book of the same name). A gift made possible by the generous efforts of the research team from PICRC. “Cream Silk” conditioner works wonders on my salt dried brushes; too bad that it doesn’t do the same for my hair. The very first week I went looking in the markets for something to use, sure that the locals suffered the same problem and had a great natural solution. I haven’t found it yet, but what doesn’t work to manage my unruly hair, does for boar bristle. I planned today as a work day. I have started several painting that I want to get under control before leaving at the end of the week. I am very afraid that when I hit the gloomy gray of New England, the color that I see each day here in the tropics will disappear from my memory bank. Like a reptile on a rock, I have been soaking up the light of Palau and working hard to get it on paper. Carol, my food and fun guide, told me that I could tag along with her and the Head of Research, Yim and his wife, Charlene(also a researcher) for a trip to Babeldaob(the main island). I didn’t waste a moment to think, and we were off to a Modekngei School where the others would help the Principal with a grant that she was working on. I had a chance to observe and photograph this lovely rural place. The grant is designed to fund a retaining wall that will stop the washouts that occur regularly on the road connecting the dormitory housing or huts to the classroom buildings. It would also prevent the sediments from silting the mangrove where the students learn the traditions of fishing and harvesting. There was a beautiful mangrove crab farm adjacent to the school’s water access. The Principle explained the strictly enforced “no swimming” rule for the students. It seems that the population of crocodiles is so well established that they cannot allow their charges to cool off in the unspoiled mangrove. It made me want to write a grant to fund a pool for these young Palauans. On the drive back Yim commented that he wished that he had millions and could himself fund a school like this, so needy and rough. I saw the same school and thought about how nice to have such a simple place to learn, so a part of the natural environment and so connected with nature. After our morning school visit, I was surprised to be treated to lunch by Carol and her husband,Yuki Dengokl, who is a state senator for Palau. It was fun to sit and talk in the quiet of the Fuji Japanese restaurant about American politics, with two people who are well read and have such compatible views to my own. We live worlds apart, but are in many respects seeing life the same. We also enjoy eating Palauan and Japanese food, the array of tastes and colors new to me but comfort food no less. I’ve finally discovered why I keep feeling as if my ancestors have lead me to this island nation out in the Pacific. At first I thought that it was my early introduction to all things Hawaiian by my adventuresome, world traveling grandmother, Margret Lowery. From each exotic location where she landed, we grandchildren would receive a large box filled with interesting clothing, food items, local crafts and gadgets(she liked the latest gadgets) so that we could experience her travels right along with her. I’ve felt as I blogged that Grandma would be the first to use this medium to share her fun with her extended family. Grandma’s generous spirit and curiosity has shaped my life. This morning on my way back from the market I stopped in the local library that I’ve wanted to check out since arriving. I think libraries are a good way to understand a society that I am visiting; they tell so much about how the people of the community dream. It was a cool oasis and so neatly arranged. I went right to the young adult novels, so that I would not look like I was gawking. Under “N” I immediately spotted one of Aunt Joan’s mysteries, it stuck high above the others and flashed Joan Lowery Nixon in oversize lettering. I think it was a large type copy, but it was not the only one. I started to count and discovered that the entire shelf was for her books. There were over thirty copies from many of the series that she wrote and some of the books that I read as a child. Encouraged by this encounter with Aunt Joan, I decided to visit Mom and looked under Collins. She was not in the young adult section (though she should be! ), but the librarian assured me that she recognized the title of “I am an Artist”, despite the computer being down and the card catalog not being current. The Librarian said that Aunt Joan’s books are very popular, so I told her that she should be sure to get some more of the work of her sister/my mother, Pat Lowery Collins; who was busy at home working on her next novel. I had to hurry back to PICRC to hang the work that I’ve done this month and to prepare to talk about it for the staff of the Center. Lucky for me that I have strong, talented woman who support my efforts; I am forever grateful to them. What you won’t find in your guidebook, but you cannot miss while visiting Palau, is the constant celebration. Traditional family customs for birth, weddings and death happen each weekend during the year. And as you might expect, in a small island nation isolated by miles of Pacific Ocean, everyone is family. Which means that each member has a responsibility to provide funds to help those experiencing a change in life marked by the event and to prepare some part of the food required to feed all who attend. The hospitality that is rehearsed with every gathering, unites the Palauan culture and their guests with the simple gesture of sharing a meal. No one goes without food here in the islands. This system for communal food preparation makes it easy to get along without cooking through the week too, and I did very little of it this trip. In every food store, open market and roadside stand, you can find local fare arranged in a small plastic box with colorful garnish at very reasonable prices. I enjoyed eating like the natives that make food a generous offering. As members of a population that fluctuates with the coming and going of family and friends, Palauan’s are also terrific at throwing goodbye parties. Today Elong and Kliu, two students that have volunteered for the Education Department this year, and I have been treated to a day in the Rock Islands with our friends from PICRC. Carol, Ines, Kyoko and Masao have planned a day to visit sites for swimming, picnicking and relaxing. To my delight, my desire to work one more time underwater was made possible at a quiet beach bordered by a seagrass area perfect for drawing. Both Kyoko and I had plenty of time to work and enjoy the relative calm of the site, tucked in the lee of the rock island. It was fun for me to see Kyoko take so easily to the process of drawing submerged with oil stick on paper, duck taped to the Center’s kitchen cutting board. Her careful attention to detail and her love of the water make it a perfect medium for her to use while she continues to explore Palau’s underwater world. After our day of fun, we gathered on the lawn to have dinner and to say goodbye to Kelly who has worked in the Administrative Office and will be leaving for California. I was again included in this going away party and so surprised to be given my own copies of PICRC’s texts, ”Coral Reefs of Palau” and “Tropical Marine Plants of Palau”. I have enjoyed reading the copies in my apartment this month and am happy to be able to take them with me so that I can remind myself of the great work being done here to study and preserve the natural features that make the Rock Islands so unique. I felt sad that I had nothing to give to so many people who had shared this great experience with me and already had bestowed the greatest gift of all; a chance to get to know them and be a part of their life here in beautiful Palau. I’ve always allowed my imagination to take me places where I want to go. It can be a bad habit that when expressed to those less open to intuitive thinking gets a curt and decidedly negative response. Thirteen years ago I decided in one breathtaking visual moment, that I would find a way to get to Palau to dive and see the wonders of the coral reefs that surround the Rock Islands unique to this island nation in the North Pacific. I was watching an Omni Theater presentation of, “The Living Sea” and had no idea how I would accomplish a trek to Micronesia, acquire the necessary skills to dive the pristine waters that surround them or for what purpose a trip to the Rock Islands would serve; but I started then to look for a way to follow the light that had meaning and value beyond my own comprehension. Sometimes there are things that you just need to do alone. Coming to Palau was one of those opportunities for me; a chance to swim in the deep end of the pool and focus on my own swimming for a change. To get here I have had many tests of my will. I was a finalist for the Armin E. Elsaesser Fellowship twice unsuccessfully, which should have been reason enough to spend my time in other more productive ways. Instead of following an obvious cue, I began swimming to train for what I knew would be a physical challenge and test of my courage. With two sons in college, a trip for me to explore an unfamiliar part of the world with zero financial potential appeared selfish. I knew that without the goal that I had created that evening in the dark of the theater, life would be monochromatic and flat. The slump in the housing market has taken a toll on my business too, making a month away from “real “ work financially risky. So many reasons to be “realistic”, and I was. Today on my last day in the paradise of Palau I am filled with gratitude. I have found the color ideas that I set out to discover in the Rock Islands and will go home with paintings, photographs and memories that will serve as a storehouse for future work. For the financial support to embark on this adventure and the encouragement to follow the light that I was first attracted by, I am very grateful to Sea Education Association and the committee of the Armin E. Elsaesser Fellowship. SEA has been the launching point for countless marine adventures and personal triumphs and I will always feel indebted for the two life changing experiences that they have made possible for me. As I look forward to seeing my family and friends, I am reminded of the role that they have played in making it possible for me to step out of their life to find my way to Palau. It has not been easy to leave my sons for the month long journey, but the confidence that I have in the help that I have been offered has made the leap more surefooted. Thank you. What makes the return home so difficult and writing this blog almost impossible is the gratitude and love that I feel for the people that have shared their life with me here at the Palau International Coral Reef Center. I dropped out of the sky into their facility with a long list of objectives to fulfill. Each person that I have met has graciously offered their assistance; honoring me with respect for my work that exceeds that which I have received anywhere, ever. How can I give adequate praise and thanks for the kindness and generosity of everyone here at PICRC? Each time that I recall an instance of a single individuals act of unselfishness I am moved to tears. Never before have I felt that my mission was so worthy. I am humbled by this culture of beautiful people, so creative and open to the risk of accepting the creativity of others. Although I had planned for every detail of this trip half way around the world, I had never planned on meeting people who shared my wonder and joy for the natural world and unconditionally accepted my way of expressing the results of my research. I am forever grateful to each of you.